Professionals have their own cues as to whether to continue with their current job or call it quits. 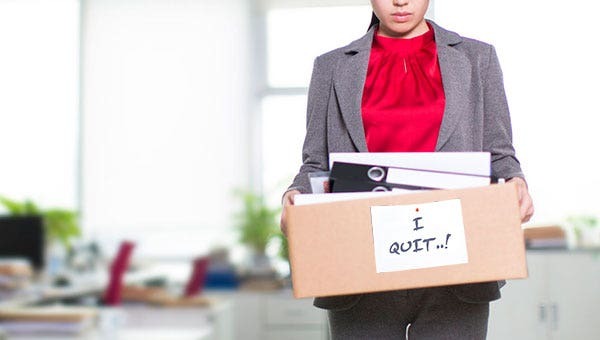 Some may resign from their job for personal reasons, while others point out other factors like the management, the salary, promotion, and the like. How you determine the right time to quit your job is a matter of personal choice. Whether to quit your current job, decline a job offer, or apply for another is your decision. However, it is also your obligation to inform the companies involved through a formal letter a few weeks before your resignation so they can prepare for it. There comes a time in an employee’s career, when for some reason or other, the thought of giving up a job just seems like a good idea. You might be feeling that way now or you wouldn’t be here. The length of your stay. It is advisable to wait for at least one year before you think about resigning. Resigning before that time would throw your ability to commit to a job into question. Work load. Consider your workload as well before deciding. If you are loaded, you may ask your immediate supervisor to assign some of your tasks to other colleagues. Render your resignation letter personally, though you can send it via email as well. If you want to check on some letter formats, you may consider rejection letter templates as well. Submit your letter few weeks ahead of your target resignation date. This is to give your company an ample time to look for your replacement. Quit gracefully. You do not need to create an issue or make a big deal of your personal concerns. Resignation letters are not so different from a rejection letter. You can even create your own resignation letter based on rejection letters. However, for your own peace of mind, here are some tips for you before you finalize your decision to quit. Talk to your supervisor in person. Your immediate supervisor should be the first person who deserves to know about your decision. If you have some work-related concerns, and you have been a good employee, he may stretch the line for you just to change your mind. Never allow personal matters to stain your professionalism. If you are resigning for professional reasons, it is better to keep some details to yourself instead of gossiping to colleagues. Create a resignation letter out of honesty, and make it short and direct. Some employees tend to play words on their letter, and the reader or the recipient will no longer know the real reason why you quit the job in the first place. Make sure to attend your exit interview or turn over some company belongings so that you receive your last salary and that no issues haunt you afterward. This is your chance to air your concerns or grievances. Prepare for it. Complying with these requirements would reflect your level of professionalism. If you exit gracefully, then there might be some possibilities that you will be hired by them again in the future.